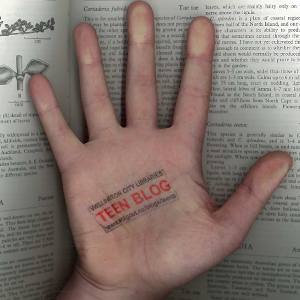 Teen Blog » Blog Archive » Tremendous Trilogies, Volume Ten. Since this is the third dystopian themed Tremendous Trilogy in a row, let us tell you a little bit about the genre. The word dystopia comes from Ancient Greek and translates to “bad” or “hard”. Dystopian settings are often characterized by dehumanization, totalitarian governments, environmental disaster, or other characteristics associated with a cataclysmic (what an excellent word, thanks Wikipedia) decline in society. More often than not, this translates into some form of social commentary as the cataclysmic decline has been caused by a current day (for us, the reader) socio-political issue. So something like pollution, poverty, societal collapse, political repression, or totalitarianism for example, has lead to said cataclysmic decline. There’s often a good old fashioned good vs evil storyline; the evil component usually being the one in power which leads to a battle or revolution at some point. There might be some characters with extraordinary abilities thrown in and of course, a love story. Of course that’s just a quick overview of some of the tropes of the dystopian genre, we’re sure we’ve missed something. And after all that learning, let us reward you with the most excellently named Chaos Walking Trilogy by Patrick Ness. Bonus! All the books have wonderful titles as well (in our humble opinion anyway). Prentisstown isn’t like other towns. Everyone can hear everyone else’s thoughts in an overwhelming, never-ending stream of Noise. Just a month away from the birthday that will make him a man, Todd and his dog, Manchee – whose thoughts Todd can hear too, whether he wants to or not – stumble upon an area of complete silence. They find that in a town where privacy is impossible, something terrible has been hidden. But it’s a secret so awful that Todd and Manchee must run for their lives. But how do you escape when your pursuers can hear your every thought? “War,” says the Mayor. “At last.” Three armies march on New Prentisstown, each one intent on destroying the others. Todd and Viola are caught in the middle, with no chance of escape. As the battles commence, how can they hope to stop the fighting? How can there ever be peace when they’re so hopelessly outnumbered? And if war makes monsters of men, what terrible choices await? But then a third voice breaks into the battle, one bent on revenge.